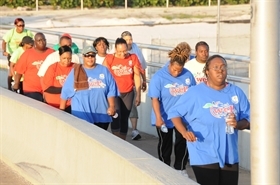 One aspect of the Get Well Bahamas Health and Fitness challenge is the Great Pedometer Step Off. The challengers are encouraged to walk 5 miles for this competition. The challenge took place at the Eastern parade and on Paradise Island, inclusive of both bridges.